Ne-Yo had a pretty sweet 2012. He once again got the world dancing, with "Let Me Love You," and the hitmaker knew that in order to close out another successful year, he had to go hard. You see, he's quite superstitious about his New Year's plans. "This is, like, kicking off the new year, and I firmly believe the way that you start the year is the way you end the year," he told MTV News, who caught up with the singer/songwriter after he took the stage for "MTV's Club NYE 2013." He explained why MTV was the only place to be Monday night, where he was joined by Rita Ora, Ke$ha, Snooki, JWoww and more. "If you start the year on a high note, you end the year on a high note." 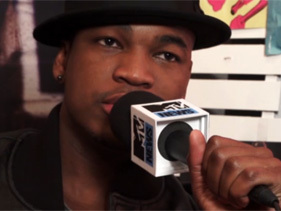 With that being said, Ne-Yo felt a lot of love in the room as he played his dance-floor anthem for the last time in 2012 and looked ahead to 2013. "The energy from the crowd, the energy from the dancers, this is like one of the last shows of the year. We've been going hard all year, so that was definitely one of those 'We got to go out with a bang,' " he explained, before further reiterating his year-end motto. "We got to bring the new year in with a bang, so that's exactly what happened." In case you're wondering, Ne-Yo really, really enjoyed himself. "I had a ball," he said. "I hope everybody else had as much fun as I did." Post-performance with the main show's cameras rolling, the hit-maker broke down what he's looking forward to in the coming 12 months. "You know what? R&B music. Y'all remember slow jams? I want R&B to make a comeback in 2013, and I'm gonna try and have something to do with that," he told "Club NYE" co-host Snooki after he stepped off the stage.